Dress Watch. Diver's Watch. Vintage. Modern. Some Clever Styling c/o Blancpain. It's a diver's watch, but it's dressy. It's dressy, but it's a diver's watch. It's modern, but it's vintage - and its styling is extremely clever. Blancpain could so easily have celebrated 60 years of their Fifty Fathoms collection with something bolder and chunkier, instead the new Fifty Fathoms Bathyscaphe 2013 is reminiscent of the original 1950's Bathyscaphe models which were smaller in diameter to the Fifty Fathoms models at that time. For a tool watch, this piece offers a quite beautiful face-on plainness which is, of course vintage inspired, but it is unusual all the same - diver's watches, even the vintage models so often feature branding overload, with up to three lines of text, usually on the lower dial resulting in dial-shrinking clutter. On the Bathyscaphe 2013 edition, the branding is diminutive, in keeping with the scaled down styling of all its features, except for the hour and minute hands which are broad, stubby and highly readable and are therefore entirely fit for purpose. In contrast, a slender seconds hand with an elongated red tip reaches right to the dial edge, it's little lume-coated dot replicating that of the hour markers. Set against a sunbrushed dial these are clever design details and their inclusion has produced something quite unique, marking a departure for the collection. Not just a handsome vintage face, the Fifty Fathoms Bathyscaphe 2013 adds a thoroughly modern scratch resistant "Liquidmetal" insert to its unidirectional bezel and inside the automatic Calibre 1315 features a silicon balance-spring, which brings anti corrosion, non-magnetic properties to add to the piece's dive credentials. The steel case measures 43mm across, but also available is a 38mm white ceramic bezel with white dial edition, destined for the brand's ladies collection. Think it's a bit too ... quiet? 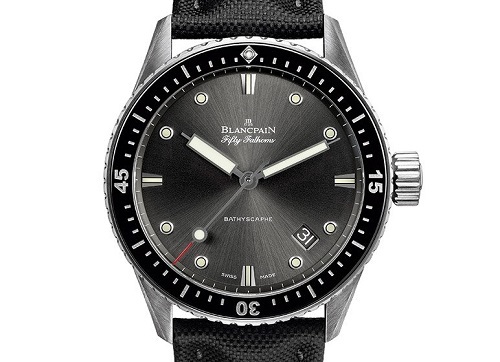 Check out the Blancpain X Fathoms Dive watch - 55.65mm of edge to edge chunkiness here.